At a public meeting in Bikaner, Gandhi targeted Modi over corruption in the deal signed with France for the fighter aircraft, repeating the charge that Reliance group benefited from from the contract. 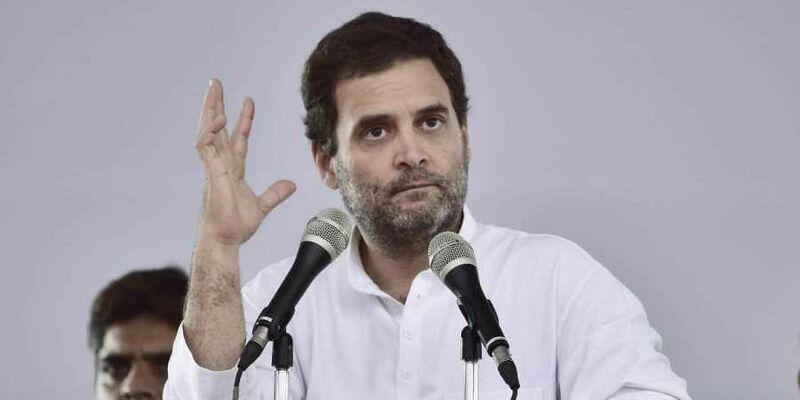 JAIPUR: Congress president Rahul Gandhi Wednesday said his party will not make false promises but deliver on whatever it tells voters, even as he continued to slam Prime Minister Narendra Modi over the Rafale fighter deal. At a public meeting in Bikaner, Gandhi targeted Modi over corruption in the deal signed with France for the fighter aircraft, repeating the charge that Anil Ambani's Reliance group benefited from a related offset contract. He had levelled similar charges - denied earlier by the government and the Reliance Group - at the meetings he addressed Tuesday in the state's Dholpur, Bharatpur and Dausa districts. At the 'Maha Sankalp Rally' on the Medical College grounds in Bikaner, he said Modi brought benefits for 15-20 top industrialists instead of the farmers. He said Congress will not make false promises to the voters. "The party and its leaders will not make promises like depositing Rs 15 lakh in everyone's bank account and providing two crore jobs every year. Our chief minister and leaders will not deliver hollow speeches and tell lies," he said. "But we will deliver on whatever we say from the stage," the Congress chief said. Assembly polls in the state are on December 7. The Congress chief referred to the migrant workers in Gujarat, saying youths from Rajasthan, Madhya Pradesh and Uttar Pradesh were being attacked in the state and forced to leave. His rally in Bikaner targeted voters in 24 assembly constituencies spread over the districts of Bikaner, Hanumangarh, Sriganganagar and Churu. Farmers and party workers in large number from the districts attended the meeting. Gandhi claimed Hindustan Aeronautical Limited (HAL) was ignored in the Rafale deal while an "industrialist friend" of the prime minister benefitted. He reiterated the party's claim that the agreement with France for 36 aircraft was finalised at higher price compared to what was negotiated by the previous Congress-led government. Gandhi accused to the BJP government at the Centre of failing to provide relief to debt-ridden farmers while wreaking havoc on the economy with demonetisation and the Goods and Services Tax (GST). He accused the prime minister of insulting people by belittling what the country had achieved in the last 70 years, with the efforts of "your parents and grandparents". "He says everything happened only after he came to power. How arrogant is this person," Gandhi said. He slammed the Centre's economic and agricultural policies, claiming "not a single rupee" of farmers' loans was waived by the Modi government while bad loans were being written off.